A real alternative to Philips Hue imo - and soooo much cheaper! I just wish they had GU10s available. Finally managed to get some! Not as cheap as previous, but quick delivery is a bonus. Thank you OP. Showing as + £8.89 for delivery. Total £19.52. Saying insufficient stock for me. Must be sold out now. Oos but perhaps try via desktop mode. £10.64 free express is what it showed. A real alternative to Philips Hue imo - and soooo much cheaper! I just …A real alternative to Philips Hue imo - and soooo much cheaper! I just wish they had GU10s available. Quick question. What is the best app to use with these bulbs? Cheers. Seems like the big change is 800 lumens as opposed to these, which are 600 lumens. Not sure why still getting heat or am I missing something? Seems like the big change is 800 lumens as opposed to these, which are 600 …Seems like the big change is 800 lumens as opposed to these, which are 600 lumens. They said it was listed as 800 but actually nearer 900 on their forums which will be great - as much as I love my existing Yeelights they are great for mood lighting but really are not bright enough to light a room properly for everyday use, even when I have several in a room grouped together. As long as the V2s are massively more expensive I'll be switching all mine over for sure. A bit annoying as I'd only just purchased a load last month but I guess the lower stand by costs will help me justify it to myself! has anyone actually manged to sync these, cannot find and connect via the app but does anyone know if they work with the amazon echo? A month since I ordered this previously, Still not here! has anyone actually manged to sync these, cannot find and connect via the …has anyone actually manged to sync these, cannot find and connect via the app but does anyone know if they work with the amazon echo? They said it was listed as 800 but actually nearer 900 on their forums …They said it was listed as 800 but actually nearer 900 on their forums which will be great - as much as I love my existing Yeelights they are great for mood lighting but really are not bright enough to light a room properly for everyday use, even when I have several in a room grouped together. As long as the V2s are massively more expensive I'll be switching all mine over for sure. A bit annoying as I'd only just purchased a load last month but I guess the lower stand by costs will help me justify it to myself! Even the standby load difference is negligible imo. Unless you're running a few hundred bulbs you'll fall to notice any difference in running costs over the course of a year lol. The 200 lumen increase is the big one, but honestly it's not a large increase either, especially as most people wouldn't run just a pure harsh white. Even the standby load difference is negligible imo. Unless you're running …Even the standby load difference is negligible imo. Unless you're running a few hundred bulbs you'll fall to notice any difference in running costs over the course of a year lol.The 200 lumen increase is the big one, but honestly it's not a large increase either, especially as most people wouldn't run just a pure harsh white. Edit - I'm an idiot - I guess the standby saving will be negated by the higher running cost when they are on anyway so I'm not likely to see any overall savings? Oh well. I reckon I'll definitely appreciate the extra lumen increase though, especially if it's nearer 300 like they said. I do think there is a very clear difference between 800 or so the Hue bulbs kick out and the 600 of the Yeelights - I have to have 3 x Yeelight bulbs set to pure white on full to light our living room properly in order for be able to see properly to work so if I can ditch one of them I'd be delighted. These aren't bad, cheap and cheerful but that's about it. 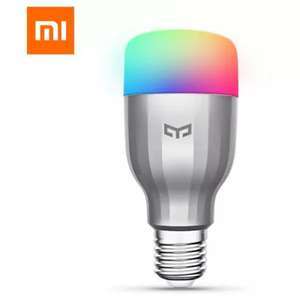 I got one from the other threads, its nice and bright in white, but as soon as the colours get switched on the brightness of the bulb is a lot weaker. Shall not be purchasing another. There's a candle flicker scene if that's any good? October 26th I ordered these. I was going to order more for Xmas if I liked them, but it's hard to tell when they're chugging overland on a diesel locomotive through Lithuania. What shipping method everyone used, as I order my first one of these on 16th November and received on 25th. Thanks - ordered a couple more! don't forget - you can get screw to bayonet adapters from Ikea - 2 for £1 - they work fine for me. Never quite understood the desire for these but now I have google home minis set up to my heating I am rather curious. But as people say (a) OOS and (b) not sure I've got anything suitable to plug this into anyway! Yeah. A bit like those electronic candles you get in Poundland. They messed up their app on last few updates and took out some good options like wake up sunrise mode etc. I've also have connectivity issues, they acknowledge they have a bug , but haven't managed to fix it yet..